Five-hundred thousand people have fled Mosul in the wake of its conquest by the jihadis. The city, which has an Arab majority population along with large Kurdish and Turkmen minorities, is Iraq's second largest. Its capture was the latest and most significant success in an offensive launched by the ISIS jihadis a week ago. The movement withdrew forces from outlying parts of Syria's Idlib and Aleppo provinces in January. The reason is now clear: ISIS was withdrawing forces and consolidating the western border of its "Islamic state," in order to focus on expanding the eastern border deep inside Iraq. The "Syrian" civil war long ago burst its borders, to become a sectarian conflict taking in the territory of Syria, Iraq and Lebanon. ISIS's tactical offensive has cast this fact into bold relief. The area to the north of ISIS's "Islamic state" is controlled by the Kurds. But relations between the Kurdish Regional Government (KRG) of Massoud Barzani in northern Iraq and the (PKK)-associated PYD's three areas of control in northern Syria have worsened in recent months. Intra-Kurdish violence has not occurred, but the KRG has kept the border between the two areas tightly sealed – leading to PYD accusations that the KRG's close strategic relations with Turkey were causing it to support the Turkish position against Syria's Kurds. The latest gains by the movement in Mosul bring it within a few kilometers of the first checkpoints of Barzani's Peshmerga forces. Thus, there is a common ISIS-Kurdish border stretching across PYD and KRG-controlled areas. So the cross-border Islamist entity is facing a renewed Kurdish alliance to its north. But what of the Baghdad government? Maliki's armed forces may have performed atrociously in recent days, but he remains part of the Middle East's single most powerful functioning alliance – the Iran-led regional bloc. The emerging reality in western Iraq creates difficulties for the Iranians. Their client in Damascus, the Assad regime, has largely recovered its fortunes in recent months. Aided by Iran's Revolutionary Guards Corps and Hezbollah, Syrian regime forces are close to encircling rebel-controlled eastern Aleppo. Maliki's declaration of a general mobilization is more likely to produce a Shi'ite sectarian military response, and hence continued sectarian fighting against a background of political paralysis. 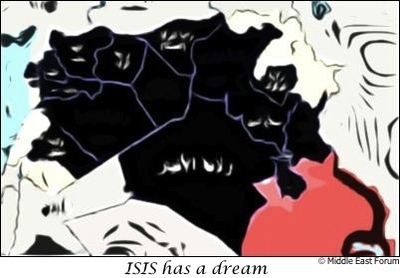 Therefore, the key point is that the "Islamic State in Iraq and al-Sham" is no longer the name of a movement, or the expression of an aspiration. As of now, it is a descriptive term applying to a de facto sovereign space, taking in a large swath of western Iraq and eastern and northern Syria. The powerful Iran-led Shi'ite alliance will in the period ahead undoubtedly seek to destroy this state.